Dental care is not only important for humans, but for pets too. Aside from trauma (breaking), dental plaque and tartar can cause dental problems in dogs, cats and horses. Good dental care can prevent serious problems and pain for your pet. Read all about good dental care for your dog, cat, horse or rodent here. Dental problems in cats and dogs, aside from trauma (breaking), are often caused by plaque and tartar. Plaque is a barely visible layer that is constantly formed on the teeth. It consists of food residue, mucous and bacteria. If plaque is not removed, it turns into tartar. You can help to remove your pet's plaque, but tartar can only be removed by your veterinarian. As your pet gets older, the risk of dental problems increases. Neglected dental problems can have serious consequences for your pet's health. Symptoms may vary from bad breath to severe gum infections or even infections in major organs. It is therefore important to care for your pet's teeth daily and to have them checked on a regular basis. 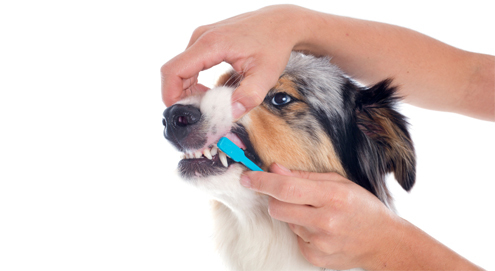 You can look after your pet's teeth in various ways, depending on what your pet will tolerate of course. You can choose to brush your pet's teeth daily, using the C.E.T Dental Care Kit, which contains everything you need. If this is too dangerous for your fingers, you can use an anti-plaque powder such as (Orozyme Bucco-Fresh or ProDen PlaqueOff) or a liquid. These powders and liquids, such as Orozyme RF2 Aquadyl or Vet Aquadent, are mixed with your pet's food or water. Of course there are also the special dental diet foods, waxes, powders and chew strips that all help to keep the teeth as healthy as possible. In rodents and rabbits, we often see the occurrence of spikes due to wear or excessive growth of the molars. In addition, a common problem is the incisors becoming too long or taking the wrong shape. These can and must be filed down by your veterinarian. A cause of excessive growth in your pet's teeth can be an excess in calcium in their diet. Aside from hay, Supreme Science Selective is a good supplement. This contains the right amount of calcium. Horses also suffer from "spikes" in their molars. These must be removed by your veterinarian or dentist. Sometimes we see that young horses' early molars remain in the mouth and form "caps" on their adult teeth. These also need to be removed in order to eat normally again. Tartar formation can also be a problem in horses. Altogether, plenty of reasons to have your horse's mouth checked on a regular basis. Chewy Chips prevent plaque & tartar in cats. Dental care kit for dogs and cats. Snacks that help counter bad breath in cats and dogs. For fresh breath and good oral health. For a plaque-free environment in the mouth of cats and dogs. Tasty anti-plaque liquid to put in drinking water. Easy-to-use toothbrush to prevent tartar.